Many people underestimate the level of effort required to build a Highly Successful Inside Sales Team. There is much more to Inside Sales than hiring some lower paid reps and connecting a phone system. To get the most out of your Inside Sales organization requires optimizing every aspect of the operation. 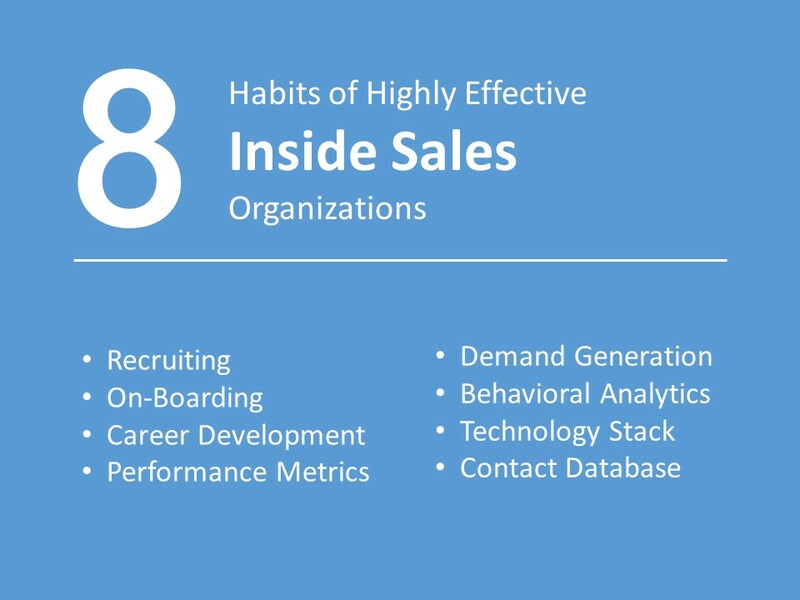 In my last post I started a list of the Eight Habits of Highly Successful Inside Sales teams. In this post I will finish the list with the last four habits. Highly successful inside sales organizations are masters at leveraging inbound marketing. They understand that today’s buyer conducts much of their research online before they are even willing to speak to a vendor. So they partner with their marketing departments to build awesome, “must read” content that ranks high in search engine results for specific keywords. They publish regular blogs that offer best practices to their target buyers. They create visually compelling e-books, white papers, explainer videos and case study webinars to gravitationally pull in prospects. 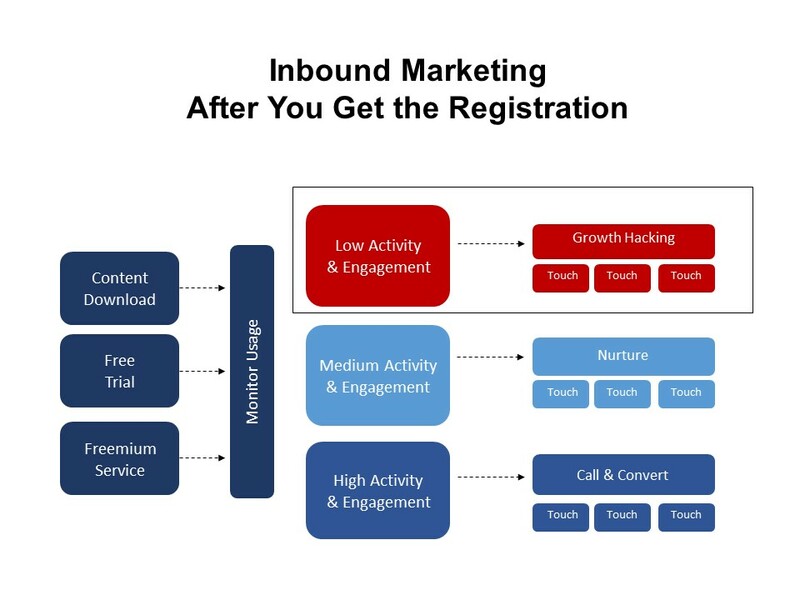 The goal of the inbound marketing strategies is to get the prospect to commit at the moment of truth. The moment in this case is not agreeing to purchase a product, but simply to register so the sales and marketing teams can begin to engage them. The prospect might register for a free trial of the product. Or they might simply register to download a white paper (watch a webinar or view an online demo). But the registration process is when the user self-identifies and opts-in to allowing the vendor to communicate with them. Highly Successful Inside Sales organizations maximize their contact rates using big data and analytics. Sales managers study data on what times of day (and days of week) are the best to call. They study data on how many times you should call back and at what frequency. They study data on what times of day (and days of week) are the best to email. They study data on how many times you should email and at what frequency. They understand how the number of words in a subject line influences the open rate. They understand how copying in multiple people impacts response rate. Before reps attempt to contact a prospect they gather all available information about the prospect. Reps view Sales Intelligence tools (Discover.org, Inside View, Crush Reports) to look for triggers (new CIO, recent acquisition) that might signify an upcoming compelling event. They look up target buyer’s profiles on social media platforms. Highly successful reps look for shared connections on LinkedIn. They understand what is top of mind by viewing recent Twitter activity. They might even explore a prospect’s hobbies on Pinterest or Instagram. All of these data points can be used to craft an “attention getting” email or voicemail to the prospect. Highly successful reps gather behavioral intelligence from marketing automation systems (Marketo, Eloqua, Pardot). Reps study whether the prospect has visited their website and if so what pages they visited. They investigate whether the prospect has opened any of their emails and if so what links they clicked through on. They identify whether the prospect has watched any videos, demos or webinars and if so how long they viewed. All of these data points can be used as conversation starters once you get the prospect live on the phone. Highly Successful Inside Sales organizations recognize the competitive advantage that can be gained by technology. They use data science to increase email opens from 2% to 3%. They use auto-dialers to improve call pickups by 4% to 5%. They use social media tools to improve LinkedIn InMail responses by 6% to 7%. While seemingly trivial, these small productivity benefits can result in a big advantage in the marketplace. Why waste time having reps enter into Salesforce.com “Attempted to call Friday at 9:40am?” Today’s auto-dialer technology can make the update for you automatically. Why stay on the phone for another 30 seconds to record a personalized voicemail? Today’s auto-dialer technology can have the system automatically send a pre-recorded message. Why waste time repetitively typing up emails to request introductory meetings or follow up thank you notes for each prospect? Email automation applications offer templates based upon best practices. Highly Successful Inside Sales organizations use technology to increase the probability of successful contact. They don’t send emails when the rep is done typing, but at the times their database shows users have peak open rates. They don’t call from toll free or far away area codes. They use local phone numbers to increase likelihood of a pickup. They don’t use Post-It notes or spreadsheets to track who and when to follow up with prospects. They use calling and email applications that track contact attempts and send reminders for follow up at optimized frequencies. 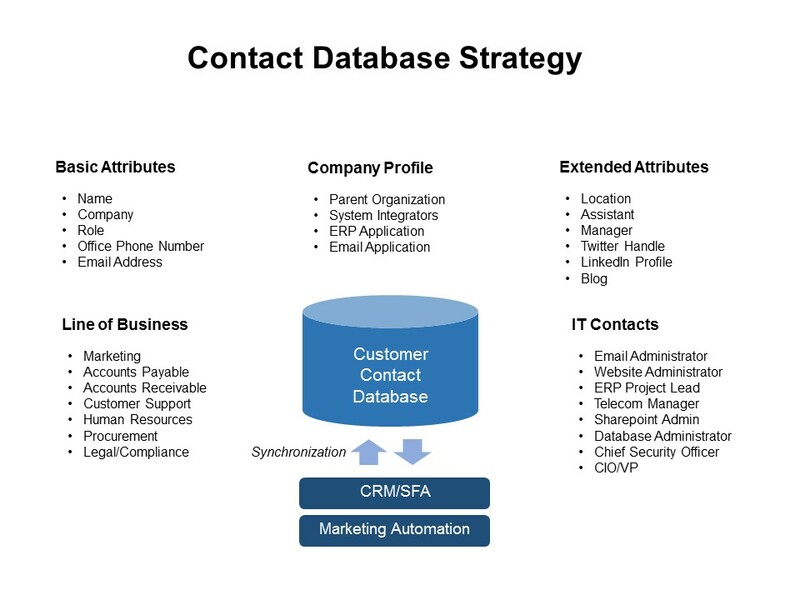 Highly Successful Inside Sales organizations view their contact database as a strategic asset that can provide them with a big competitive advantage in the marketplace. They place a dollar value on each individual contact and data record they collect. To purchase lists from outside vendors, each contact might cost $50-$100. With the same value per contact, a database of 1 million contacts would be worth $50M-$100M. Highly Successful Inside Sales organizations proactively build out contact records for key buyer personas in accounts matching their ideal customer profile. For each target account they seek out one to two decision maker contacts in each department (IT, marketing, sales, human resources). They gather not only the phone number and email address for contacts, but gather other useful insights such as what ERP/CRM system the company is running; what system integrators they work with; even the names of the executive assistants. Highly Successful Inside Sales organizations recognize that 25% of all contact data becomes out-of-date annually as people switch jobs both inside and outside the four walls of their company. They invest in specialized data cleansing services to append information to their database records (company size, individual titles) at regular intervals. They recognize that there is a huge correlation between data quality and contact success rates.